President of American developer Tripwire Interactive had to recently stave off fears from the PC community concerning the fact that their upcoming Killing Floor 2 would also be available for the PlayStation 4. At last week’s PlayStation Experience in Las Vegas, Tripwire revealed that the sequel to their popular PC-exclusive shooter, Killing Floor, would be coming to the PlayStation 4 as well. This sparked concerns from the PC community that Killing Floor 2 would be consolized, a widespread occurrence in which developers of complex PC-centric games dumb down and simplify their sequels to suit less capable console platforms, and some would argue, console gamers. Many well respected franchises that got their start on the PC have been subject to consolitis, such as Crysis, Ghost Recon, and Dragon Age. President of Tripwire Interactive John Gibson, who once publicly bemoaned the effect that console-based shooters like Call of Duty were having on First Person Shooters, took to the official forums to address these concerns. The post is fairly lengthy, and Gibson goes into great detail to assuage PC gamers’ worries over Killing Floor 2. Right now, shipping a game on a console adds about 10% additional work (very rough estimate) but opens your fanbase up to tens of millions of additional gamers. So if we as a studio can do 10% more work but gain 25%, 50%, even 100% more customers that’s a great thing and here is why. Lets say we could afford to spend $2,000,000 making a game for the PC only, but we could afford to spend $4,000,000 if we released it on PC and console. In the end PC gamers get almost double the features and content as the developer could have afforded to make if they released the game on a single platform alone. Over the past few years you’ve been benefiting from this but never knew it. Great multi-platform games like Farcry 3, Dishonored, etc all wouldn’t have been possible at the scope that they were released at if they were only on a single platform. Longer answer, the PS4 version has no impact on the gameplay of the PC version. PC is the lead platform, and the game will be separately tuned to play well on both the PC and the PS4. PS4 gamers are likely in for a harder game than they are used to. 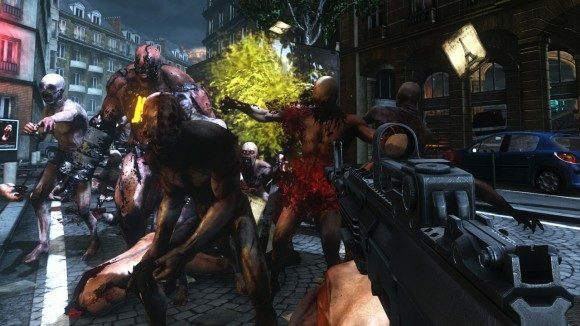 The original Killing Floor began as a mod for Unreal Tournament 2004, but the popularity of its co-op based action allowed for Tripwire to mount a full-blown, larger budgeted sequel. Killing Floor 2 will be set in Europe a month after the events of the first game, and is set for release sometime in 2015.